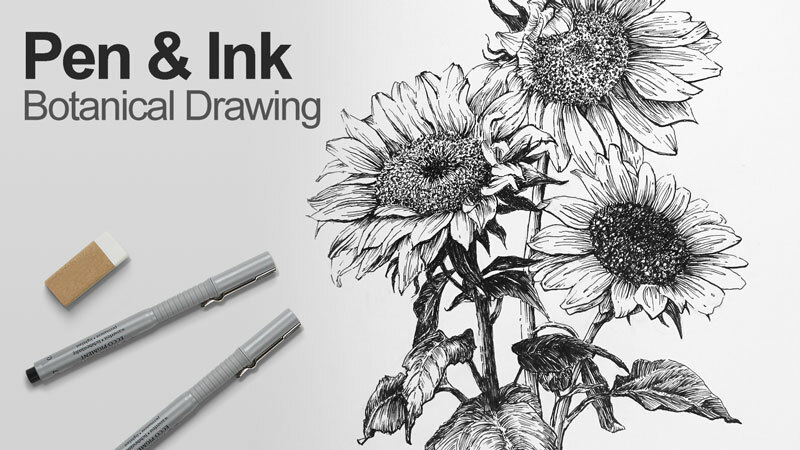 Learn how to draw a botanical subject with pen and ink in this four-part lesson series. Lay out the basic contours with graphite and gradually develop the texture and form with line work applied with technical drawing pens. I’m curious. When you did the general shapes of the sunflowers did the general shape include the petals of the flowers? Or are we supposed to allow space for the petals to stretch outside of the circles and ellipses? Hi Brandy, Yes, the general shape included the petals. I like to work from broad shapes first and then define the smaller shapes within the larger ones. The ellipses that were drawn for the overall shape of each flower included the petals. I then went back and defined the shapes for each petal within the larger elliptical shape. Hi Matt, Just got back from a trip to Madrid, so I’m catching up. I thought you might like to know that the correct pronunciation of Staedtler is Stedler. Were there technical difficulties posting #3? Hi Christine, Part 3 aired live last night. Recorded versions of the Live Lessons are posted on Saturday or Sunday after the air date. Part 3 will be posted during the day tomorrow. Ah, thanks!! 🙂 Have a great weekend. I vote for watercolor/colored pencils!! !